Precisely 100 days before the CHIO Aachen 2019 begins, we have received an important confirmation: The dressage superstar Helen Langehanenberg will be taking part at the Soers. And not only in the sports competitions, but also in the most extraordinary concert of the year: Horse & Symphony. The Horse & Symphony concert unites a spectacular show programme with live music by the Aachen Symphony Orchestra under the direction of the General Music Director, Christopher Ward. Helen Langehanenberg already performed in the “Horse & Symphony” concert in 2013 and she was impressed by the atmosphere in the Deutsche Bank Stadium – “I am really looking forward to taking part again,” commented the team World and European Champion and two-time winner of the Deutsche Bank Prize at the CHIO Aachen. 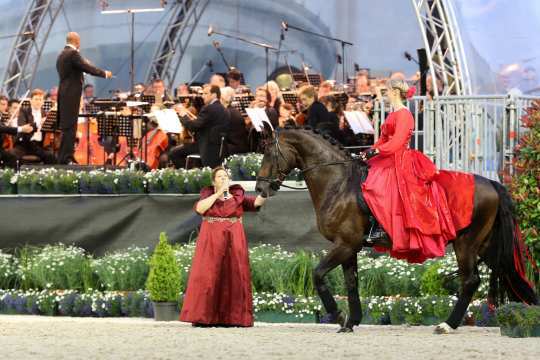 The “Horse & Symphony“ concert is being held on two evenings during the CHIO Aachen 2019, the concert starts at 8.30 p.m. on both days. Tickets are still available for Friday, July 12th, either online or from the hotline on +49-(0)241-917-1111.